(Bridgewater, N.J., Sept. 23, 2018) – The Long Island Ducks defeated the Somerset Patriots 3-2 in 10 innings on Sunday night in Game Five of the Liberty Division Championship Series at TD Bank Ballpark. The Ducks win the best-of-five series three games to two and are the 2018 Liberty Division Champions! Long Island struck first in the top of the second inning when Taylor Ard doubled and then came home to score on a two-out RBI single by Rubi Silva off Patriots starter Bobby Blevins. Somerset responded in the bottom of the third when Endy Chavez grounded a two-run single up the middle off Ducks starter Dennis O’Grady. It stayed that way until the fifth when the Ducks tied the game at two. Jordany Valdespin singled and went to second on an error, Daniel Fields walked and David Washington came through with a two-out RBI single to right. Neither side would push across a run over the next four innings. Fernando Abad pitched three perfect innings in relief for Long Island before Francisco Rodriguez worked around a leadoff double by Ramon Flores in the ninth, stranding the winning run at second base. With two outs and the bases empty in the top of the 10th, the Ducks rallied off reliever Logan Kensing to take the lead. Following back-to-back singles by Ard and Washington, Ramon Cabrera lifted a single into right-center that put the Flock on top 3-2. 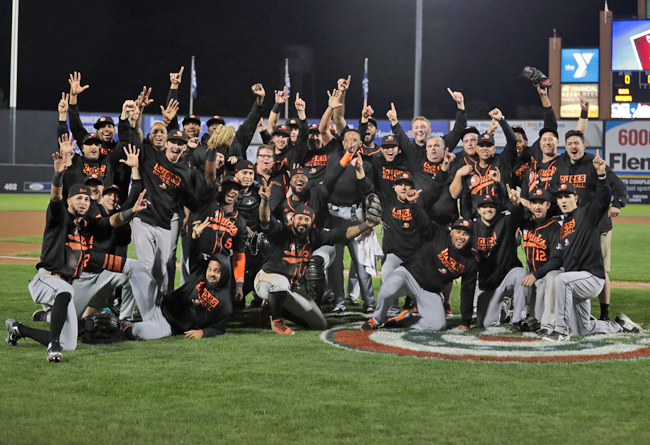 Matt Larkins then entered in the bottom of the 10th and worked a scoreless inning to pick up the save and send the Ducks to the Atlantic League Championship Series. Neither starter factored into the decision. O’Grady lasted five innings, allowing two runs on six hits and two walks. Blevins pitched six innings of two-run ball, yielding seven hits and two walks while striking out six. Rodriguez (1-0) picked up the win after a scoreless ninth inning, working around a hit and an intentional walk. Kensing (0-1) took the loss, conceding the winning run on three hits in the 10th. Valdespin, Ard, Washington and Cabrera each had two hits to lead the Flock. The Ducks now advance to the Atlantic League Championship Series where they will take on the Freedom Division champion Sugar Land Skeeters. Games One and Two of the best-of-five series will be on the road at Constellation Field in Sugar Land, Texas, with first pitch for each game scheduled for 7:05 p.m. CDT. The series will then return to Bethpage Ballpark on Friday night for Game Three. Game time is slated for 6:35 p.m., with the Bethpage Ballpark gates opening at 5:35 (5:20 for full season ticket holders). The first 1,000 fans in attendance will receive Ducks Thundersticks. Tickets for the game, and all Ducks home playoff games, are on sale now! Fans can purchase their tickets by visiting the Bethpage Ballpark box office, calling (631) 940-TIXX, CLICKING HERE or visiting the Ducks mobile app. Those unable to make the Championship Series games can follow all the action on the Long Island Ducks Broadcast Network. Live streaming HD video and audio will be available via BoxCast on the Ducks official Facebook page, YouTube channel and at LIDucks.com.